For the 2017 model year, the half-ton pickup class has been better for the redesigned Nissan Titan. A year before the beefier XD version debuted for the buyers who need a more powerful truck than light-duty versions but don’t want to pay a price for the heavy-duty models. Now, Nissan is working on the new 2018 Nissan Titan which should bring the missing cab configuration and new engine option. For the 2018 model year, Nissan should add the final cab option currently missing. It is an extended Cab or King Cab version which comes with smaller rear seat than the Crew Cab but has longer cargo bed. With the new Cab version, Nissan should also offer the V-6 engine option which comes as an alternative to currently only available the 5.6-liter Endurance V-8. The new 2018 Nissan Titan will look confident and capable. The bold grille with active shutters will dominate up front and LED headlights sits on each side. The model will also have sculpted hood which, however, sits lower than on the XD model. The Titan will also get the two-tone body treatment with the specific shades for the fenders, lower side panels and bumpers. Inside, the model will continue unchanged. We will again see the simple and functional design with a number of storage bins and large center console. The model will also have the simple center stack with driver oriented design and large, easy to use controls. What is also important, the Titan will have supportive front seats which will provide the long-ride comfort plus you can upgrade them with the leather upholstery as well as with the power, heating and ventilating functionalities. The new version of Titan will add the missing extended cab version. This version will also ride on the same wheelbase like other cab options which means it will get a unique cargo bed. Actually, this version will include a standard 6-foot 6.7-inch bed. As a comparison, the crew cab version features 5-foot 7-inch bed while the regular cabs come with the long 8-foot 2.5-inch cargo box. On the other hand, the Titan should again be available in the same trim options. Available will be the S, SV, SL, luxurious Platinum Reserve and off-road focused Pro 4X. When it comes to powertrains, the new 2018 Nissan Titan should add a new V-6 engine option to the current V-8 unit. However, Nissan still hides the specification of this engine. Some reports suggest that an alternative could be a 4.0-liter V-6 engine from the Frontier but with added direct injection and other improvements. It is also possible that Nissan will offer a 3.5-liter V-6 engine. However, we believe that again the most of the sales will go to the current 5.6-liter V-8 engine. It can produce 390 hp and torque of 394 lb-ft. It works in the pair with the 7-speed automatic and the front wheel drive is standard. As an option the all-wheel drive is available. 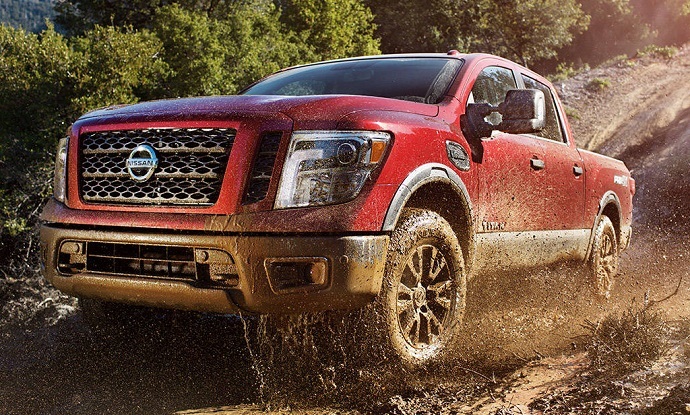 With this engine, Titan returns around 18 mpg combined and can tow up to 9, 390 pounds. The new 2018 Nissan Titan with the new engine option and cab configuration should arrive by the end of this year. The base models will cost below the $30, 000.